I think I over-stocked on shirts on that day mid-March when I realized that I cannot wear my sweaters anymore (haha). I bought different kinds from plains to dressy, to my favorite the logo tees, and have overused them all throughout summer. Same with my sneakers, rain or shine, casual or formal, I cannot imagine myself wearing any other footwear. For the few who are asking, I usually shop in sports stores, in Zalora (they have authentic Champion and Adidas), and in Uniqlo (plains, prints, cartoon characters). My recent rediscovery is Landmark! Now that rainy days are here, I still wear my tees layered with either a jacket or my favorite--a spag straps dress. The transition from summer to rainy days calls for more pieces of clothing put-together, but still with the same style I am currently loving - comfortable with a clash of sporty and girly. People might call it "street style", but I'd like to call it "commuter friendly". Anyway, sharing some of my outfits from the last of summer. As you can see, I am still your serial 'outfit repeater" as I play favorites even with my wardrobe. I hope I made them look "new" every single time by wearing them a bit differently from the last. I knew it's going to be HOT in Bali, so I brought unusual stuff that I don't usually wear like off-shoulders, thin polo shirts, and even shorts! I am not fond of wearing shorts! Haha! Off-Shoulders from Uniqlo, colorful pants from Roxy, slippers from Havaianas, round bag from Rags2Riches, pink luggage from Lipault. Lemons polo shirt from local brand Lawud, long shorts from H&M, sneakers from Skechers. 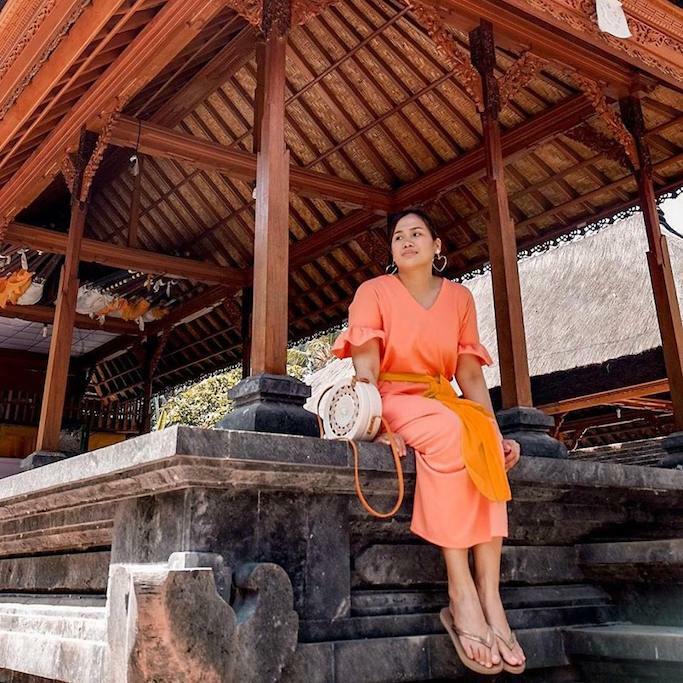 Dress from another local brand Simone's Closet, bag from Ubud market, slippers from Havaianas. When we went to Taiwan, I brought almost all-summer pieces (like Bali) since I knew that Taiwan spring is already over since March (we were there last April). As usual, Taipei proved to be the most unpredictable when it comes to weather, that even our accuweather apps get confused! Anyway, wrong outfits = excuse to shop!!! Black favorite cap from Penshoppe, shirt with polka dots pocket from Uniqlo x Marimeko, pants with flared deets from SM Woman, sneakers from Skechers. Pink coat from GU, fisherman hat from Champion (available in Zalora), polka dots shirt from Uniqlo x Marimeko, layered with slip dress from SM Woman, sneakers from Skechers. Polo bought in Bali, shorts from H&M, Champion hat, Skechers sneakers na paulit ulit ko sinusuot! Read more on my Bali and Taiwan travel posts! I usually get to play around with my style during events. Brands do not require dress codes all the time, so I base it either on the venue or the product they are launching. During the hottest days of the summer, you will often see me in skirts and tees. I just rotate them! Haha! My legs got so itchy and acquired weird rashes that it's hard to wear tight pants. Hello again to my Uniqlo x Marimeko polka shirt, skirt from GU, Puma bag from Zalora, Ikea socks bought in Taiwan, and my overused daddy sneakers aka D-Lites from Skechers. Mostly from the boys: Bucket hat from Uniqlo, shirt from Anti Social Social Club (available locally in Popcorn General Store), black jeans from Uniqlo, sneakers from Adidas, bag from Balenciaga. The concept: Two lippies in one pretty box set for only Php 395. One is the usual liquid matte lippie that dries fast and stays for hours, while the other tube is the "topper" which has glittery finish. I think what completes any outfit is your makeup. I love the new line from Vice because they are sooo affordable and creative! You can wear them together, or individually. The glitter topper can also serve as eye makeup or even highlighter. Like in fashion, it's fun to experiment with makeup from time to time! First time to meet Vice Ganda in person and I must say sobrang standout nya! The moment this top Filipino celebrity held the mic, you know that Vice knows what he is talking about. May laman mga stories nya. Champion bucket hat, shirt from Tokyo, skirt from Unarosa, belt bag from SM Parisian, smiley socks from Happy Socks, sneakers from Skechers. Favorite black cap from Penshoppe, new fave white shirt with scallops neckline from Happy Mallows, denim apron dress from Landmark, Nike fanny pack, Skechers sneakers. Not the usual footwear! Black cap from Penshoppe, Uniqlo x Marimeko shirt, Unarosa maroon pants, ballet flats from sneakers technology from Butterfly Twists. First time to wear ballet flats, and medyo madami nag comment sa Instagram ko na naninibago sila! Haha! I won't really wear one if it's not as comfortable as one of Butterfly Twists' newest style from their SS2018 collection. It has sneakers technology making it more comfortable than the usual flats! Plus, yey for black! If you are more of the colorful and pastels type like my friend Ava, sharing the other styles from Butterfly Twists' recently launched collection, featuring Glaiza De Castro as the new face of the campaign. Follow Butterfly Twists for more! Special thanks to Vice Cosmetics, Butterfly Twists, and all the other brands who has been so generous to me! PS: Follow me @anagon #anagonOOTD! PPS: Heading to Europe next month! Any outfit tips for a European summer (backpacking)?💖 Sobrang excited ko na! anaaaa I want your IKEA socks and Skechers!